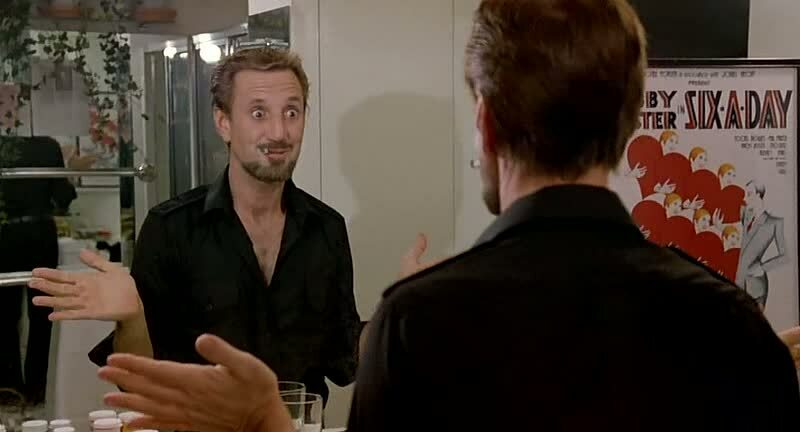 I almost managed to live to the age of 40 thinking that Bob Fosse’s All that Jazz would be a film I’d hate. High camp, stage dancers from the days when disco was just about still alive but definitely already starting to smell funny funny and the like aren’t exactly on my list of favourite things; I’m more of a whiskers on kittens and David Fincher’s Seven kinda guy. It was only when Criterion brought the film out on Blu-ray and Matt Zoller Seitz did his video essay on the film (embedded at the bottom of this post) that I thought I should perhaps try to get over my Fear of a Leotard Planet. In short, I was transfixed. A couple of years ago I wrote about artifice and authenticity in films, and already while watching All that Jazz I was startled how well the former was used to evoke the latter. The film is often highly stylised, it eschews the surface markers of realism, it embraces camp and staginess like so few films do, and even fewer do successfully. The style of All that Jazz is showy, but it’s never insecure or needy: there’s an almost staggering confidence at play in the film. It’s rare to find a film that has learnt the right lessons from theatre, and that understands how limiting cinema’s obsession with realism is. That’s perhaps the main thing I took away from All that Jazz: it’s exciting to see a film that isn’t beholden to a narrowly defined and all too often shallow representational realism. While it wouldn’t fit all kinds of films and stories, the kind of illusion that’s more common to the stage is something I wish film would embrace more often. Filmmakers try to make things look more real, but we know that what we see isn’t real: the dinosaurs and flying superheroes are pixels, that tower with a big flaming eye on top is a miniature, and that guy running with a gun is Tom Cruise. There’s a certain demented futility to the extent to which cinema is often at cross-purposes with itself: movies want you to get excited about the extravagant illusions they create, yet they want to hide the fact that they are illusions. There’s a fetish of the seamless – and it isn’t limited to CGI orgies: in a way, what Linklater was aiming for with Boyhood was also the seamless appearance of reality. There’s definitely a place for that, but realism isn’t inherently more valuable than other modes of representation. To my mind the most powerful illusion is often not the one that is seamless: it’s the one where the audience sees the illusion for what it is, a mirage, and fully buys into it nevertheless. Obviously, film isn’t theatre, and what works in one medium has to be adapted for another. I wouldn’t want all movies to resort to the Brechtian strategies Lars von Trier resorted to in Dogville. I do want film to be less fixated on the invisibility of its illusions, though: the more magic happens entirely on the screen, the less it happens in my mind. All that Jazz‘ magic isn’t entirely that of the stage and its visible wires, but it rejects a superficial realism. It invites the audience into a much larger and more exciting space. Its reality is emotional first and foremost, its razzle and dazzle is artificial and has no qualms about this – artifice can heighten reality much more than a seamless illusion can. It opens up space and time, showing what a tiny stage realism is. How many leotarded angels can dance on the head of the pin that is realism? Many times fewer than Fosse was able to imagine, I’ll wager.